A native of Cincinnati, Notre Dame Linebacker Bob Crable attended Moeller High School, where he played for eventual Notre Dame Head Coach Gerry Faust. While with the Crusaders the pair won three consecutive state titles and never lost a game, going 36-0 from 1975-1977 with Crable being named the Ohio Player of the Year. During the summer, Bob played baseball for the Midland Redskins. Midland was run by Joe Hayden, a Miami (OH) grad and friend of Bo Schembechler, the Miami and the eventual Michigan football coach. Just like Schembechler, the Redskins wore blue caps with a maize block M. With this connection, the thought was that Crable would be a shoe-in to head to Ann Arbor to play for Joe’s best buddy. But a persistent recruiting effort by Notre Dame assistant Brian Boulac persuaded Bob to head to South Bend. It would not be the first time Crable would disappoint Schembechler. 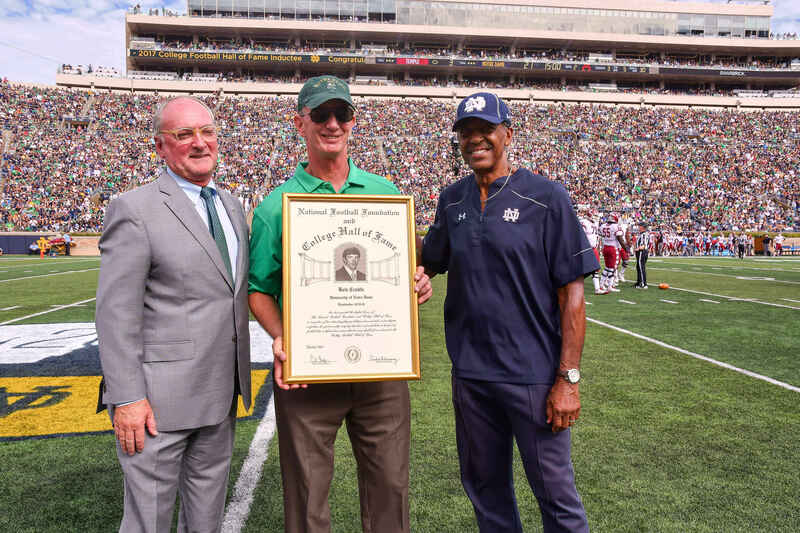 After the spring of 1979, Crable became the Notre Dame’s starting middle linebacker. In his first game as a starter he would get his first genuine opportunity as a member of the Fighting Irish to disappoint Bo. The new leader of the Irish defense started slowly as Michigan gained 212 yards of total offense in the first half. But ND only surrendered ten points as they trailed 10-6 as the two teams headed for the locker-room. While the defense pitched a second half shutout, the offense added two more field goals to take a 12-10 lead. Late in the game the offense turned the ball over giving Michigan one final chance. The Wolverines advanced the ball to the Notre Dame 25 yard line looking to kick a game-winning 42-yard field goal with 0:06 left to play. “So at that point” thought Crable,”If the center going to stay down my solution became going over the top. When the ball was snapped, I stepped on the center because he stayed down. It would have a good field goal because it hit me in the thigh.” After blocking the ball, Crable’s momentum caused him to tumble forward falling on his head. “I was fortunate I didn’t hurt myself. The adrenaline is so strong that you run off the field and life is great,” he recalled. Crable wasn’t done irking Schembechler. The next season Bob had 19 tackles in another win over Michigan. The game was won in ironic fashion as Harry Oliver, one of Crable’s Moeller teammates, kicked a last-second, against-the-wind 51-yard field goal for the 29-27 win.